Luzern, Switzerland – Trima Solutions AG, a leading software and digital signage applications developer, is excited today to announce the launch of ProStream Mobile, a Digital Signage Toolbox onto the App Store. Compatible with all iPad devices, this unique tool gives users the power to create and stream digital ads or portfolios from anywhere right from their iPad. The perfect asset to help business grow via professional quality ads or to enable users to display personal work via enticing visualizations, this app is built with ease of use and intuitive practicality at its forefront. ProStream Mobile is currently available for download on the App Store for $14.99 in the Business category. A veritable digital signage creation hub, ProStream Mobile lets users create ads & portfolios through a single centralized hub and stream them to an Apple TV or display them on the iPad with a touchscreen disabling function, all right from their device on demand. The app features intuitive editing and content creation tools that let users assemble ads or portfolios with ease while providing them with a highly organized space to develop new visual content and save completed projects all at once. Users will no longer be forced to outsource digital ad creation initiatives, nor will they need to become design and animation experts. 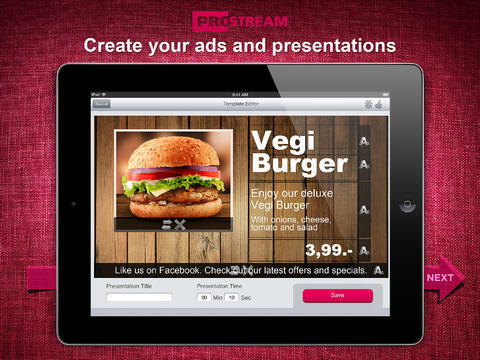 Simply put, with ProStream Mobile all they need is an iPad and a few minutes to get acquainted with its straightforward ad creation tools. Creating new ads or portfolios is handled as a step-by-step process. Users simply create slide templates via the app’s creation toolbox, use existing templates, link slides together via the app’s Timeline, and tie them together seamlessly via customizable transition effects. Slides can be freely enhanced with text, video clips, Tweets, RSS Feeds, Photos, and much more as well. Once users are finished creating their newest digital ad or portfolio, they can stream it instantly with the click of a button. Its time to put the power back into your hands. Get ProStream Mobile and start creating digital signage on your own terms. 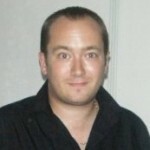 Founded in Luzern, Switzerland, Trima Solutions AG is a software development studio committed to making professional Digital Signage creation platforms available to everyone, without ever compromising on quality or any other elements that are so important to companies and individuals running small businesses. © Trima Solutions AG 2013. All Rights Reserved. ProStream and the ProStream logo are registered trademarks of Trima Solutions AG. Apple, the Apple logo, iPhone, iPod and iPad are registered trademarks of Apple Inc. in the U.S. and/or other countries.